EXTRA THICK YOGA MAT – Meglio have created a yoga mat with a 12mm thickness to ensure that you are supported and comfortable as possible when the yoga mat is in use. The 12mm thickness is perfect to perform yoga positions and even support you for fitness workouts that target your abs. 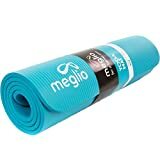 FREE CARRY STRAP INCLUDED – Meglio 12mm yoga mat is easy to carry and can easily be rolled up into a compact size and carried on the go to your yoga or fitness workout classes. The Yoga mat length is 183cm x 61cm. MULTI PURPOSE – Meglio’s Yoga mat is a not just designed to be used for multiple uses. Whether it is yoga, Pilates, core workouts, gym routines and meditation. The Meglio yoga mat is designed for you. NON SLIP SUPPORT – The Meglio yoga mat will support you during your yoga positions and fitness workouts to make sure you only concentrate on achieving the yoga position or on reaching that extra repetition. HIGH QUALITY & LONG LASTING – The 12mm thickness yoga mat was designed to with stand the day to day usage of yoga class and fitness workouts. The yoga mat uses high quality NBR foam which is durable for a large amount of usage. – Improve your recovery time, meaning you can recover from an injury faster or reduce the aches after a workout.